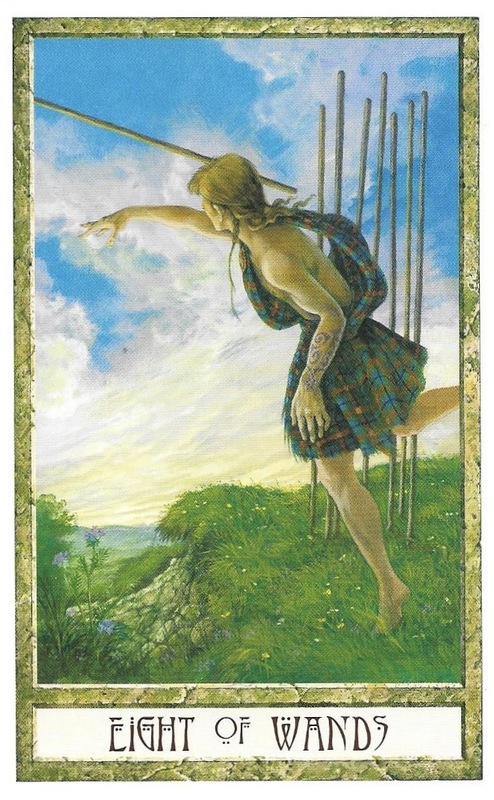 News, travel, progress, and swift movement, these are just a few of the meanings associated with the 8 of Wands. Bear in mind that Mercury does not end its retrograde for nine more days, so paying close attention to all of the movement swirling around you will be of the utmost importance. Also note that, just because Mercury is retrograde, it does not mean you cannot see progress on a particular front. Taking note of the re-‘s, it is quite likely you can suddenly see delays around a certain project dissipate. Today’s action around you denotes change, and it may feel a bit like a whirlwind, but it will be welcome change nonetheless. There will be a five-hour void-of-course Moon for many of you, but once it moves on into serious, hard-working Capricorn, you should really be able to sink your teeth into a few choice errands you wish to accomplish. As for the travel part of this card, one should heed the rules of Mercury retrograde and make certain that you are roadworthy, etc., for whatever your adventure may entail. This entry was posted in Card of the Day, General Tarot, Patreon, Readings, Weekly Tarot Guidance, YouTube Videos and tagged 8 of Wands, Guidance, Path, Reading, Tarot.